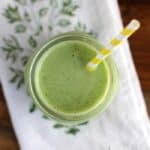 This delicious and healthy breakfast Tropical Green Smoothie, with sweet tropical flavors and added protein, will fill you up and satisfy you for the morning. Smoothieeee!!! Healthy smoothies are so hip right now. Erryone’s drinking their breakfast. All the cool kids are doing it. ..I’m a huge proponent of drinking down nutrition. Especially one with yummy sweet fruit. 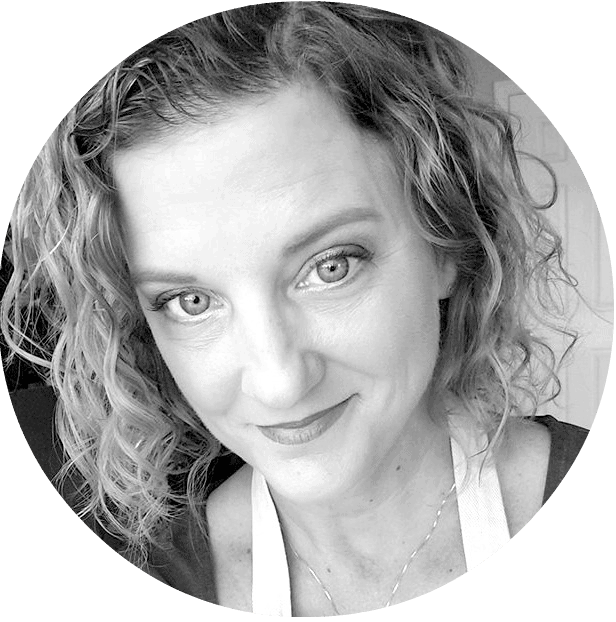 When I was pregnant with both my kids, I had vegetable juice every day – had to hold my nose to get it down, but I drank those veggies down religiously. My daughter loves 2 things: Starbucks and smoothie places. And she knows I’ll take her if she buys (she’s always got more cash than me ….grandparents, jeesh). The last couple times we got smoothies, I got a Tropical Smoothie that included greens and I had them add protein. The fruitiness was yummy, but I could taste the protein – there was kind of a graininess going on in the background that was off-putting. No bueno. And soooo, I started making my own smoothies at home. My way [smiley]. 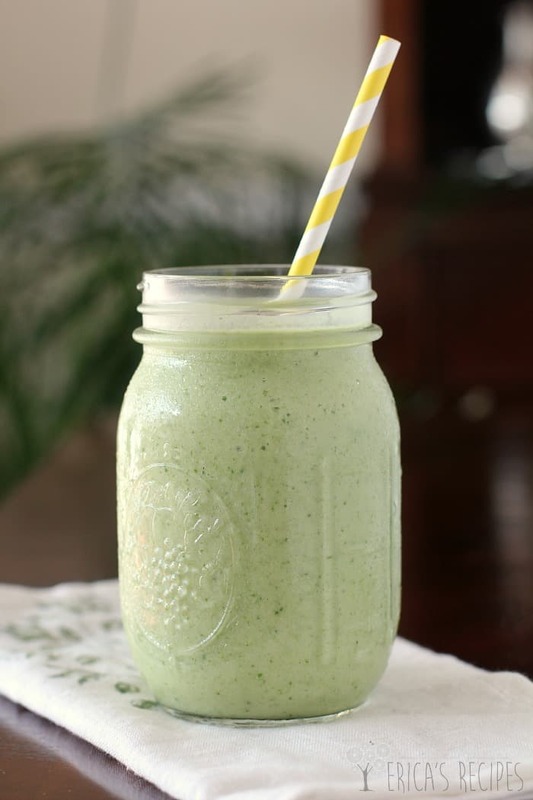 And this deliciously green drink is the best smoothie I have made yet. I have been using EAS protein for a few years now, and currently I’ve got both vanilla and chocolate in my pantry. If you don’t believe me, check out my Super Good Morning Green Smoothie and as my son says, “told’ya” (that smoothie will totally cure a hangover too …just saying). I keep bags of the ingredients for this smoothie ready to go in the freezer too. So why do I use EAS? Well, they taste great …but vanilla is vanilla and chocolate is chocolate – in a smoothie, any protein powder is going to taste fine. ….actually, I use EAS for 2 other reasons. One, it dissolves easier than other powders I have tried. I’ve got another brand sitting in my pantry that I never use because it’s always gloppy. Sounds silly, but these things matter. I do not like a full serving of protein in my smoothies. That is what causes the graininess I mentioned earlier. And EAS (and I love this, don’t ever change it EAS!) provides a smaller scoop with a serving listed as 2 scoops. So I just use half a serving, and EAS makes that easy. This way I get enough protein, but my smoothies stay tasty tasty. See! Brilliant thinking, no? (pats self on back for being soooo clever). …and with EAS’s new packaging, there’s a little clip for the scoop in the lid so it doesn’t get lost in the powder. In the middle of the morning rush to get out the door, this pleases me immensely. 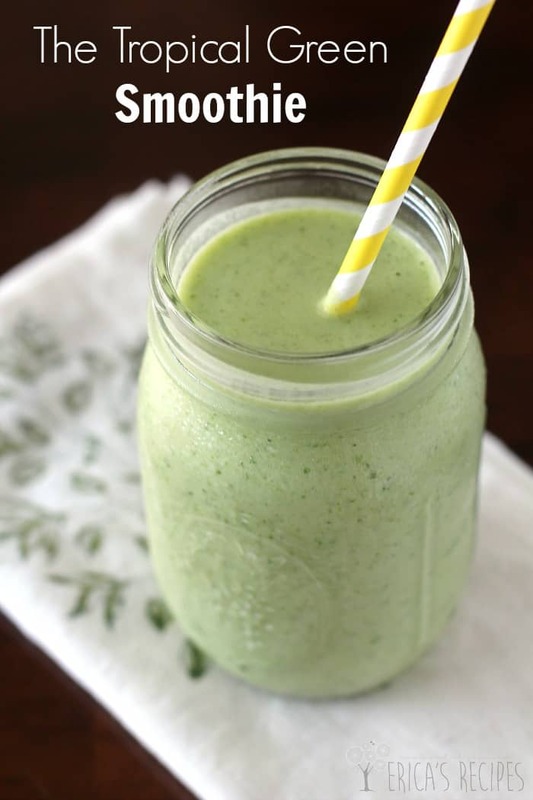 This Tropical Green Smoothie is obviously packed with nutrition: 31% daily allowance protein, 15% daily allowance for fiber, loads of antioxidants and vitamins A, K, and C, from the fruit and spinach, calcium and vitamin E from the almond milk. All for 220 calories. I haven’t done this, but if you want to up the nutritional anty even more, throw in an eighth of an avocado for some uber-healthy fat. …And the greens! If you haven’t started drinking your greens yet, please please please get on the bandwagon. This smoothie tastes like a tropical pineapple-mango paradise, you will not taste the spinach. So, here’s my new Tropical Green Smoothie kids. I have had one almost every morning for a month and I can report it is consistently delicious and satisfying, especially after a morning workout. Smoothies like this are so healthy and convenient with a zillion different ways to change them up and make them perfect for you. Slice the pineapple and mango each into 6 portions. Cut each banana in half. 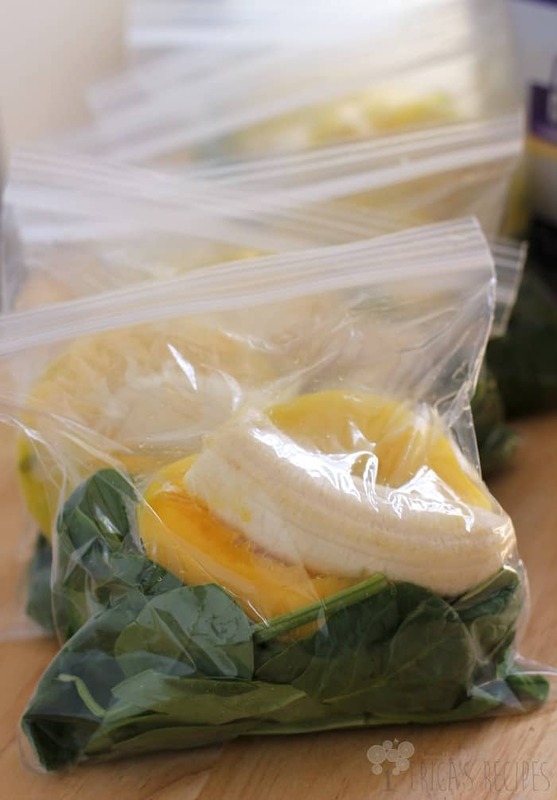 Divide the bananas, mango, pineapple, and spinach in 6 sandwich bags and freeze. 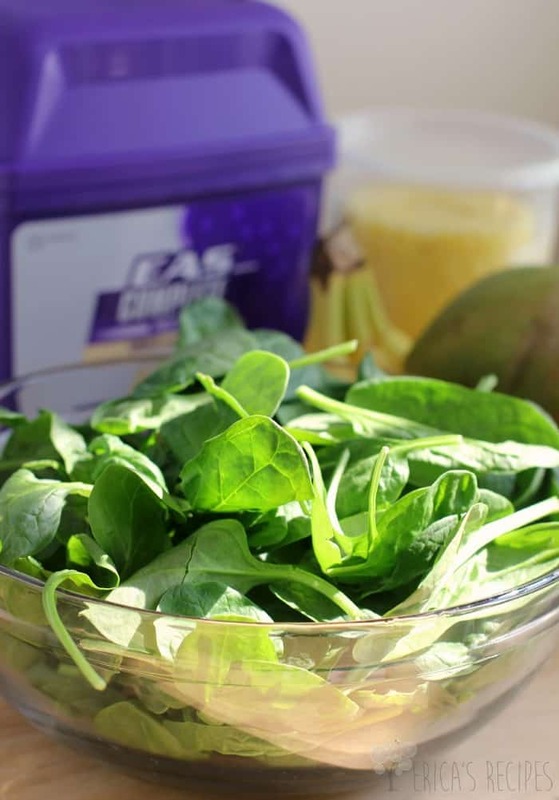 Take a bag of frozen fruit and spinach from the freezer. 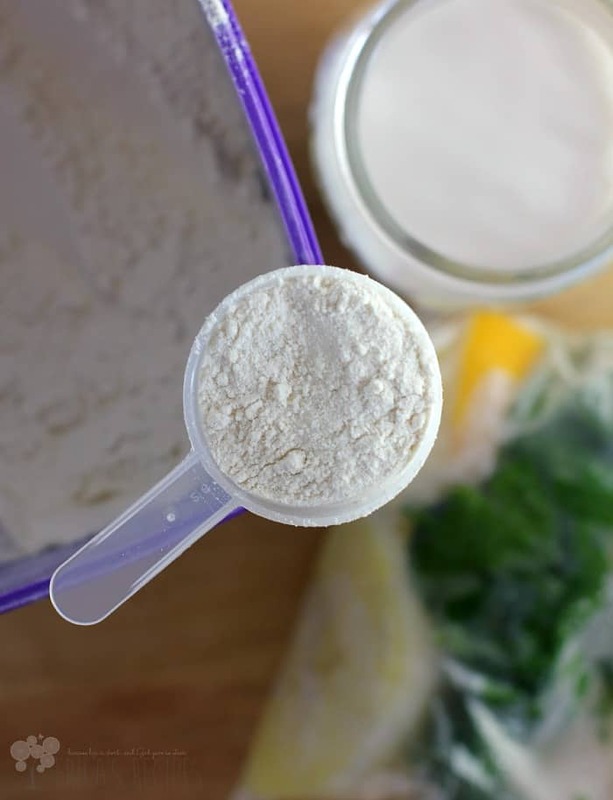 Blend with 1 cup of almond milk and 1 scoop EAS protein powder. Enjoy immediately. Yields 6 servings. That sounds amazing. I need to try this for sure. That looks so good. I love that you added a tropical twist to it. This is soooo my kind of smoothie Erica and I will definitely be trying it very soon! What a fabulous smoothie recipe! Great way to start the day and good to know the discount at Target! I haven’t used this brand of protein before but I have used hemp protein and it was terribly gritty. Usually the protein in my smoothies comes from greek yogurt, but I’m willing to give this a try. I agree, I love making smoothies! Maybe I’ll do that for the kids this afternoon. And protein is something I always need more of in my diet. This sounds great! Looks so good, and we totally agree; a smoothie is an ideal breakfast if you’re looking for something healthy to start the day! This sounds like the perfect way to start my day. I love green smoothies! and this one sounds amazing!! can’t wait to make it tomorrow! I worked at a smoothie place my first year in college. I know that protein after taste all too well. This looks so much better! This sounds amazing! I love smoothies! TASTY! 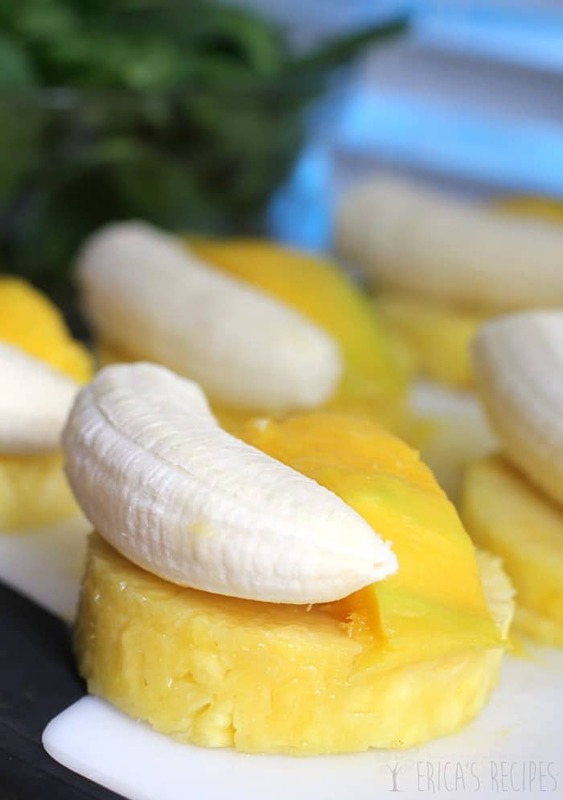 Such a good idea to portion each serving so you have it ready to blend up! Great minds! I bag up individual smoothie ingredients for my son too! I make a tropical green smoothie but never thought to add protein powder to it. Sounds so good! Such a great idea to bag up individual servings of the ingredients to freeze. I have a smoothie every morning. Thanks for the fun recipe! I love this smoothie recipe. All the ingredients look fabulous. I really need to try it soon!! 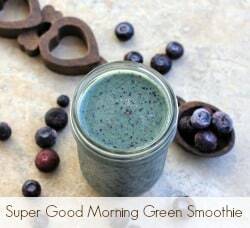 It’s so silly that I’ve been afraid to try a green smoothie, because this looks fabulous! I think your tropical angle won me over. I generally do not drink smoothies of any kind–mainly because I do not have a blender–and because I am allergic to bananas which seem to be in every one of them. I just love green smoothies! 🙂 And I love the added protein in this one. Well doesn’t this look fantastic! I have been big on green smoothies off and on, but never enough that after the first week I felt the need to keep making them. I should hop back on the bandwagon!